May 23, 2018 at 9:11 pm. 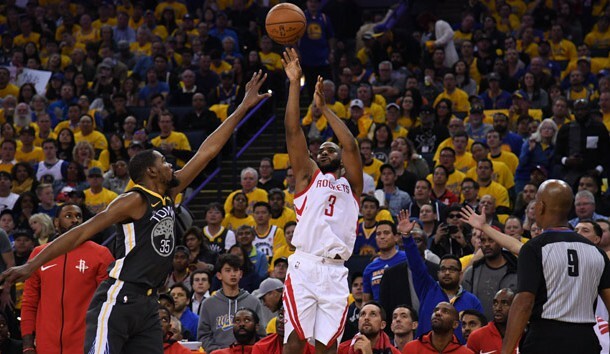 HOUSTON — Any lauding of the Houston Rockets’ resilience in Game 4 on Tuesday at Oracle Arena begins with an acknowledgment of their defense, with cliched adjectives serving the general purpose of explaining how they overcame a double-digit, fourth-quarter deficit to claim victory and square the Western Conference Finals before the series relocated back to Toyota Center. “We scored 12 points,” Warriors coach Steve Kerr said of the fourth period. “So it’s not like we were getting great shots either. The Warriors paced the NBA in assist percentage (68.5) during the regular season. The Rockets, conversely, ranked 22nd at 55.7 percent, relying on the isolation brilliance of James Harden and Chris Paul. And while Golden State features two exceptional one-on-one talents in Kevin Durant and Curry, isolation basketball doesn’t reflect the Warriors’ offensive identity. The Warriors’ 14 assists in Game 4 represented a series low. Their 48.2 assist rate in the series is worse than the Rockets’ assist percentage (49.3), a remarkable and surprising development. The final period on Tuesday revealed Golden State at its most unrecognizable and disjointed. That level of perseverance wasn’t attached to the Rockets’ collective identity or aligned to Harden individually. But in Game 4, Houston finally won at Oracle Arena and snapped the Warriors’ 16-game home postseason winning streak. After falling to the Warriors in five games in consecutive postseasons, the Rockets have finally cleared one hurdle. Another one awaits.